Product #21861 | SKU NBB75DFIB-P | 0.0 (no ratings yet) Thanks for your rating! 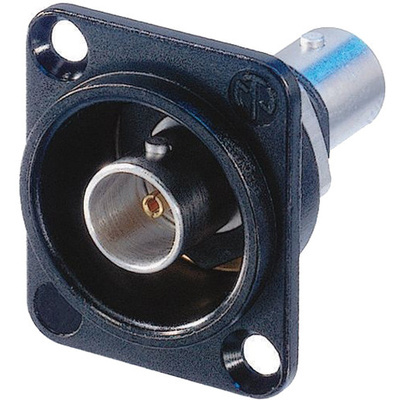 The Neutrik NBB75DFIB-P Isolated BNC Chassis Connector is a feed-through connector in a black D-shape housing (audio industry standard). This is a protruding-version connector that makes locking and unlocking of conventional BNC cable connectors easy. This connector features a true 75 Ω design for serial and digital (HD) signals. The machined brass connector body provides rugged and non-abrasive connection for long term use.